Twist Prophy Angles are disposable, 90° reciprocating prophy angles. Twist Prophy Angles feature an oscillating motion that eliminates splatter and frictional heat. According to the manufacturer, the design allows continuous contact and pressure on tooth surfaces for maximum stain removal. Twist Prophy Angles are packaged in individually sealed 100-count bags in four styles: soft cup, firm cup, flat brush, and tapered brush. The manufacturer claims include that the lift and dab technique is not necessary due to ergonomics of the angle design, that the product is safe for use on gingival margins and exposed dentin, and that they are ideal for applying dental medicaments and preparing teeth for etchants and whitening procedures. Twist Prophy Angles in soft and firm cups and tapered brush were evaluated by 31 consultants in 1394 uses. They received an 85% rating. 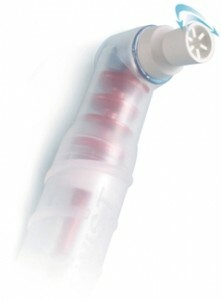 Twist Prophy Angles fit onto handpieces well and performed without failure. Nearly all of the consultants liked the lack of spatter and overall design of the cups that allowed them to adapt to the tooth surface. The reciprocating motion produces some noise and a feeling of vibration or chatter. Many consultants were using handpieces for which it was not possible to monitor the speed to achieve the recommended 4000 rpm. 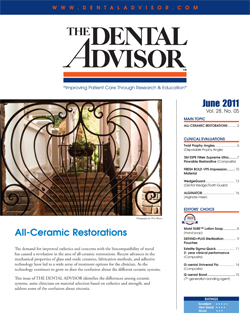 Several consultants noted that stain removal was more dependent upon the prophy paste than the prophy angle being used. Twenty-six percent of consultants reported that Twist Prophy Angles were better than their current prophy angles and 32% reported that they were equivalent. Thirty-six percent would switch to Twist Prophy Angles and 52% would recommend them. Operate Twist Prophy Angles at 4000 rpm to reduce vibration. Maintain constant speed and use a sweeping motion with moderate pressure. Always operate the drive shaft of Twist Prophy Angles in alignment with the axis of the handpiece. Do not flex Twist Prophy Angles at an angle to the handpiece. The manufacturer recommends viewing their instructional video (http://www.crosstex.com/videos/Twist.html ) as the need for “constant contact” when using Twist Prophy Angles is a new technique and requires a change in behavior.